Following a car accident resulting in injuries for which you are receiving medical care, you may be wondering why the insurance company is not paying your bills as you go. The insurance company does not want to pay your bills yet because they want a chance to investigate the treatments you are receiving. They use this information to determine if the care is reasonable. The insurance company will wait until you have been released from care to complete this assessment. Even though the insurance company waits to pay the entire claim, this can be helpful, as it offers the opportunity for you to present all of your harms and losses to the insurance company in a complete package. This helps you to ensure you will receive appropriate compensation for relevant expenses you may not have anticipated. 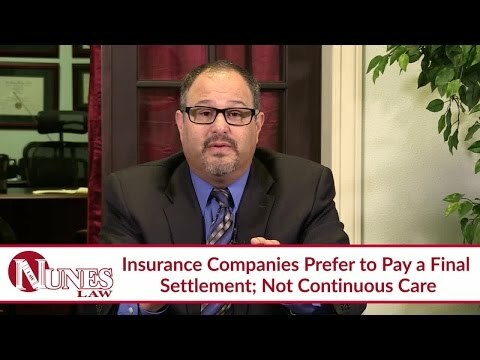 Another reason an insurance company waits to pay for your medical bills is to avoid having to litigate a claim a second time after they already paid it out. Watch the video to learn more. If you have additional questions regarding an insurance company paying your medical bills following a car accident, I want you to call me at (559) 436-0850. I welcome your call. Visit our educational website at www.NunesLaw.com for more videos and media content from our law firm.